Whether it is for an aircraft dollie, engine maintenance stand or other application, CasterDepot has the aerospace casters you seek. 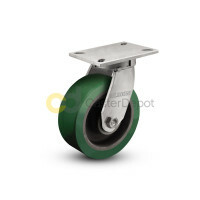 We carry a full selection of kingpinless, shock resistant dual wheel and locking stem casters in addition to an array of forged steel, urethane on iron and pneumatic wheels. With light to heavy duty casters featuring a range of dynamic capacities, our Caster ConsultantsTM are standing by to be your traffic controllers and safely navigate you to mobility solutions chosen with your exact specifications in mind. If you can’t find what you’re looking for here on our website, let us know. Our catalog of 1,000,000+ products is still in the process of being uploaded.